One of the most familiar faces in the international scene, always committed fully to the task in hand, integral to the success of the Korea Republic, Yang Haeun emerged the one player to upset the order of merit, as play came to a conclusion in the opening round of the Women’s Singles event at the Seamaster 2018 ITTF World Tour Platinum Australian Open in Geelong on Thursday 26th July. Required to compete in the qualification tournament, contrary to expectations she reserved a second round place. The 24 year old from Seoul beat Japan’s Hina Hayata, the no.10 seed in six games (13-11, 11-8, 9-11, 9-11, 11-5, 12-10). Disappointment for Japan but for the Land of the Rising Sun, overall it was a most profitable evening session of play. Mima Ito, the no.3 seed, beat Singapore’s Lin Ye (13-11, 10-12, 11-7, 11-9, 3-11, 11-4); Miu Hirano, the no.4 seed, accounted for Choi Hyojoo, like Yang Haeun from the Korea Republic (12-10, 11-8, 11-9, 11-6). Similarly, Hitomi Sato, the no.8 seed, used her defensive skills to good effect to overcome India’s Manika Batra (11-9, 11-2, 11-7, 11-4), whilst Saki Shibata, the no.13 seed and very much the revelation of the year having won ITTF Women’s Singles Challenge Series titles in Croatia and Spain, accounted for Slovakia’s Barbora Balazova (12-10, 11-6, 11-7, 11-4). Imposing performances, it was the same from Korea Republic’s Jeon Jihee and Singapore’s Feng Tianwei, the winner when the tournament was held in Sydney in 2014. Jeon Jihee, the no.15 seed, fought back from a two games to nil deficit to secure a full distance success in opposition to Li Jie of the Netherlands (9-11, 9-11, 13-11, 11-5, 11-6, 5-11, 11-6); in a similarly hard fought contest Feng Tianwei, the no.6 seed, ended the adventures of China’s Li Jiayi (12-10, 11-8, 9-11, 11-4, 9-11, 11-8). 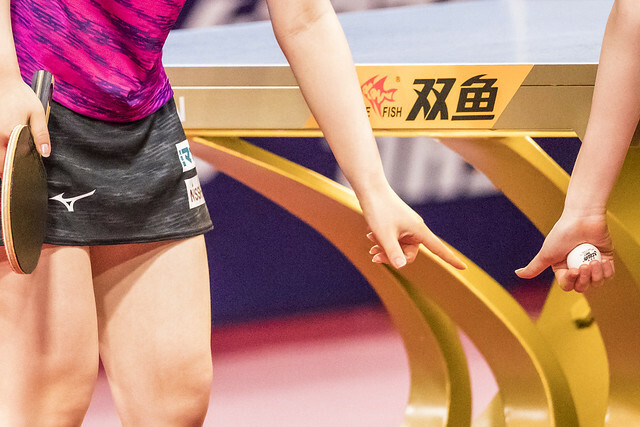 Performances to attract the attention but if there was one player on whom eyes focused it was Li Jiayi’s colleague, Ding Ning, simply because of her exalted status in the sport. She did not disappoint, she beat Chinese Taipei’s Cheng Hsien-Tzu in four straight games (11-7, 11-6, 11-6, 11-8).